As ever, this has been a very full week at ISD. Next week is even more so, but we will quieten down soon after. I have photos of our Earth Day fun below, and more from the WCM Finale will appear next week. 2. Final Parent Workshop - Resiliency on Tuesday April 29 at 8:30 in the Conference Room: The mindset of resiliency is the ability to recover from setbacks; the quality of bouncing back. Resilient people see challenges as opportunities. The workshop will combine information sharing and group discussion to identify strategies to teach your child resiliency. Please do come along for the talk and a coffee with Pam. 3. Art Salon: Please do come along to see the K-5 Art work on display at the 2nd Annual Art Salon. 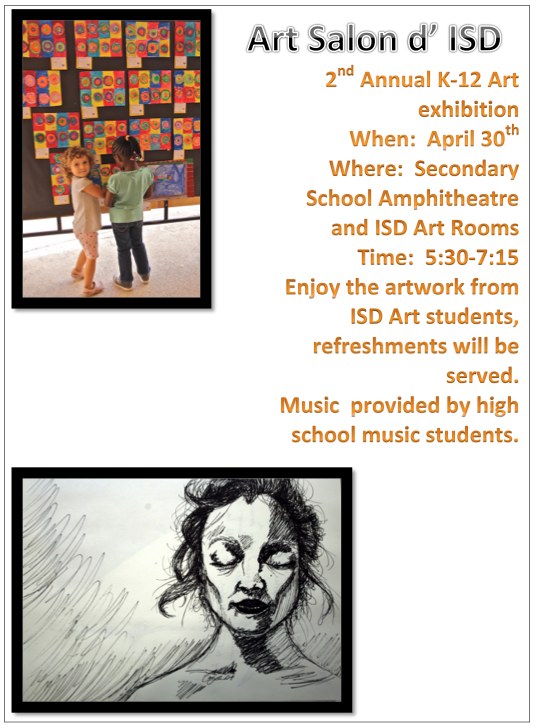 Every K-12 child will have a piece on display after school on April 30 from 5:30-7:15. 4. Assemblies Upcoming: We have two Elementary assemblies next week. KB and 3C will be hosting on Wednesday and Friday respectively. Please do come along if you can. School is closed on Thursday May 1. 5. MAP Tests Approaching: We will be beginning our final set of MAP assessments beginning the week of May 5. These will run through the next 6-day rotation. As with all the MAP tests we schedule these so that they have no impact on any of the specials classes, such as Art, Music, PE or French. The reports will be sent home shortly after, and more information for new parents on the MAP assessments can be found by reading the MAP Parent Toolkit, linked HERE. 6. Elementary School Summer Camp: A letter was sent home on Wednesday this week to find out the interest level for an Elementary School Summer Camp. If there is enough interest, this will run from 9:00am - 3:00pm on June 16-20. This is only for Pre-K - Gr 5 students who are currently attending ISD. For those new to the school, we ran the same day camp last year which was also coordinated by Ms. Bockarie. Please send the completed flier back to your child's teacher if you are interested. 7. Basketball Updates: On Tuesday last week, the Gr 4 & 5 basketball team played Dakar Academy. Coach Levers tells me that the Jaguar Blacks - lost the first game 17 to 25 and won the second 25 to 21. The Jaguar Yellows lost their first game 17 to 25 and won their second game 25 to 11. They all had a bunch of fun and showed great sportsmanship and skill. There is a rematch at ISD at 4:00 on Tuesday 29. 8. 2014-15 Academic Calendar: As I am sure you are aware, the calendar for the 2014-15 school year is on the web site HERE. Please note that the first day of school will be Monday, August 18, and the Opening Ceremony will be that morning, starting at 8:45. We will then begin Day 1 after the assembly.